What is it about being frugal, why do it? Actually, some people don’t do it at all, they have decided that what they want and desire is what they are going to get and they feel they deserve that lifestyle. I have no trouble with that; more power to ya, live long and prosper and may you die with the most toys. However, for me, I find little value in the things around me. When I was a teenager, things were my identity, I had a little saying that I stole from a Queen song, "I want it all, and I want it now." However, as I have gotten older and through one situation or another I have learned to separate myself from the items in my home. Quite a few years ago I was given a leather jacket, I always wanted one because I thought they were cool and thus, I would be cool. I got it and I loved it, I loved it so much I rarely wore it for fear of losing it or ruining it beyond repair. I wanted it to stay ‘new’ and always carry that memory I had of when I first received it and the person who gave it to me. As the years passed and I was in some hard times, I needed money for necessities and didn’t know what to do, until I saw the jacket in the closet in all it’s shiny newness and cleanliness. “I could get some money for that”, I thought. I proceeded to take it to the pawnshop (this was before eBay/Craigslist) and got A LOT less than what in my mind it was worth to me. It killed me to take that jacket in, but I had to and to do it, I had to distance myself from the experience so I could get it done. And surprisingly, I still have the memory of receiving that jacket with no loss of value in my mind. Since that time, through losses via theft, loss or forgetfulness, I have learned that my own self worth or value isn’t based on what I have around me. Please don't get me wrong, I in no way think I am better than the person that drives a fancy car to their 5 bedroom home, in fact, I hope they are happy. But for me, I will never aspire to that. For myself less is more in my world; less to worry about, less to find space for, less to keep up. But, again, that’s not everyone’s cup of tea. Your level of tolerance for less may be higher than mine. I could easily whittle down my needs and wants, throw them in the car and go. That is how little I really need, besides a roof over my head and a steady stream of income. Frugal living isn’t a dreary task, I think we need to reward ourselves here and there. My luxury is going to the movies and seeing the blockbuster action movies and dramas. But doing that regularly would no longer be a treat, and would end up being a waste of money. Frugality is also about moderation. 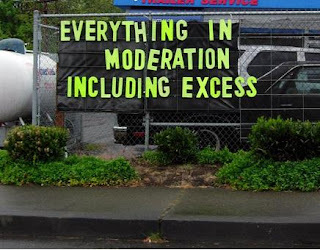 Moderation is key no matter if I am eating, drinking, watching TV, going to movies or exercising. Excess is what happens when I stop controlling my life and let something else run it. It’s about keeping things in check, whether it’s my reasoning for buying and item or getting caught up in the good feeling a TV commercial gives me. Frugal living is temporary for some until they get back on their feet, for others it is a day to day necessity for who knows how long and for myself and others it is a voluntary decision, wherever you fit in there, I welcome you to the site and hope to see you back again. I think that frugality is what leads to financial wisdom and discipline. I think that there is a big difference between being frugal and being cheap. We also learn more about ourselves when we have some insurance that we can manage money as opposed to being managed by money. My question is not why do it, it's why not. Great post. It's not how much you make, it's how much you spend.